Sounds like a lovely way to spend a day to me! That’s a gorgeous bike to be in love with. Didn't 'the kid' let you ride his at the last KY rally? Got you hooked, didn't he? Nice bike, says the ignored Aprilia. TFinch1990 you can swap the coupons left to right. It helps a bit with reach/stretch. Not a stop n go kinda bike, but open road, and it's pretty comfy. As Yogi implied, you can swap the clip-ons left for right, but you also have to flip them upside down. And drill holes for the pins in the switchgear. Also helps to shape a piece of aluminum 5/8" thick and JBWeld it to the bottom of the sidestand. Good lookin Spot you found there, Todd.. It handles like its on a rail and pulls like a freight train. Just leave the clipons stock. As Dr. John intended. Flipping the stockers puts them at a funny angle and doesn't help much. Using Heli-Bars doesn't offer enough improvement and puts them at a funny angle. 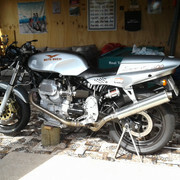 Years ago I managed to graft a V11 LeMans faring onto my Carb Sport. It's not that hard really. 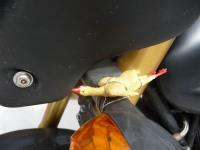 Gave me many better options for riding position and bar choice while making excellent aerodynamics. 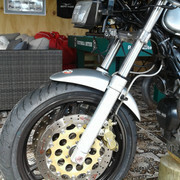 The hard part today would be finding the fairing and its fittings!!! 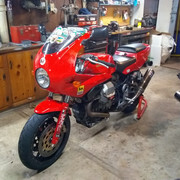 I recently did some work on the front end of my sport. While I had the bike stripped I decided to flip the bars. I carefully measured out the holes and drilled the extra locator holes. I then temporarily remounted the bars to see how things lined up. 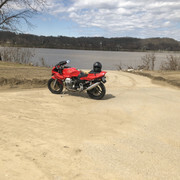 I sat on the bike to try things out. The angle of the flipped bars was not at a natural angle for the operation of the controls and I quickly realised that the bars should go back to the standard position. 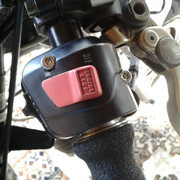 One thing I did manage to achieve was to secure the throttle firmly to the bars by modifying the switch housing to 5mm through bolts. I was going to fit a Tomaselli throttle but after purchasing new fork tubes, seals, bushes, wipers, steering head bearings and tyre the budget was getting stretched. Once you've tried the best, I'm afraid there's just no hope for you at all. Yes there is a 1/8" rocking of the throttle housing on mine. I have Heli-Bars on my 95 spot. I like them more than the stock set up. 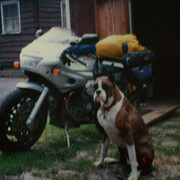 My buddy has one that I've ridden a few times. 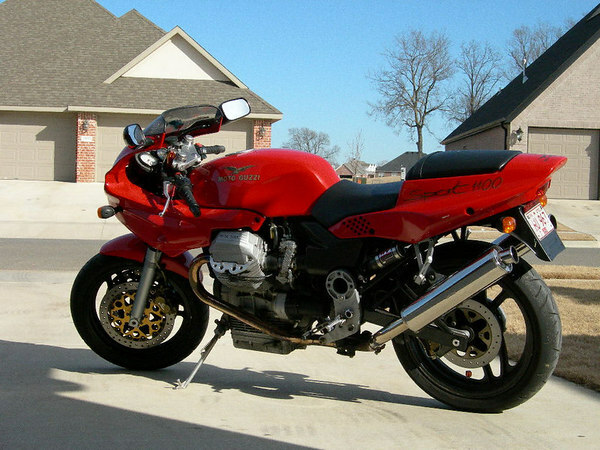 I like to call it Moto Guzzi's version of the Kawasaki ZX11. Like you say, it rides like it's on a rail and pulls like a freight train. Being sore is understandable. Even when I was younger and in decent shape, those darn clip ons were rough. Me too, but they haven’t been available in years. Never had an issue with the clip-on's I'd be a bit wary of shifting the seating position significantly if you like to push on a bit, the sport's weight bias is towards the rear. It's possible in about third or second gear coming out of a corner to bulldoze the front end around when riding in a sportsman like manner. 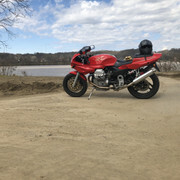 They are a fun bike completely pedestrian compared to anything modern and the handling it pretty good up to a piont, there are a few compromises however, long wheel base, rearward weight bias and lack of ground clearance when you start to ask the big questions. Are you trying to tell me I'm old? 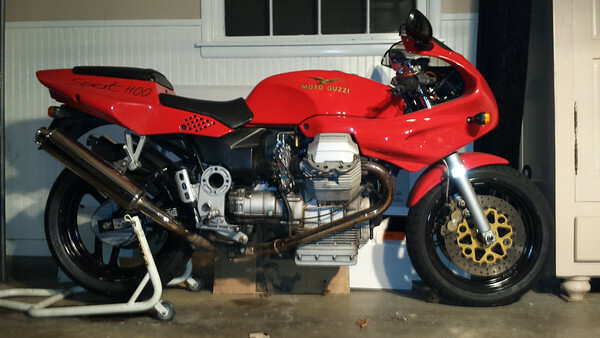 I bought my first Guzzi sport bike in 1987 so if you are, that might make two of us. By far the best looking bike MG has ever produced. 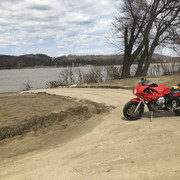 Probably the most " addicting" motorcycle I have ever owned. Had I not adopted my 83 Le Mans III, I would still have my black 97. Enjoy! Adopting is good! Oh, you meant motorcycles?